Just a couple of weeks ago we took our last overnight bus in Argentina from Mendoza back home to Córdoba. The kids were just as thrilled with it as they were the first time we took an overnight bus from Córdoba to Buenos Aires. The fancy “suite class” buses in Argentina are quite deluxe, and have approximately one million times more room than any coach seat on an airplane. If you have the time, I would recommend an overnight bus over a flight just about any day. 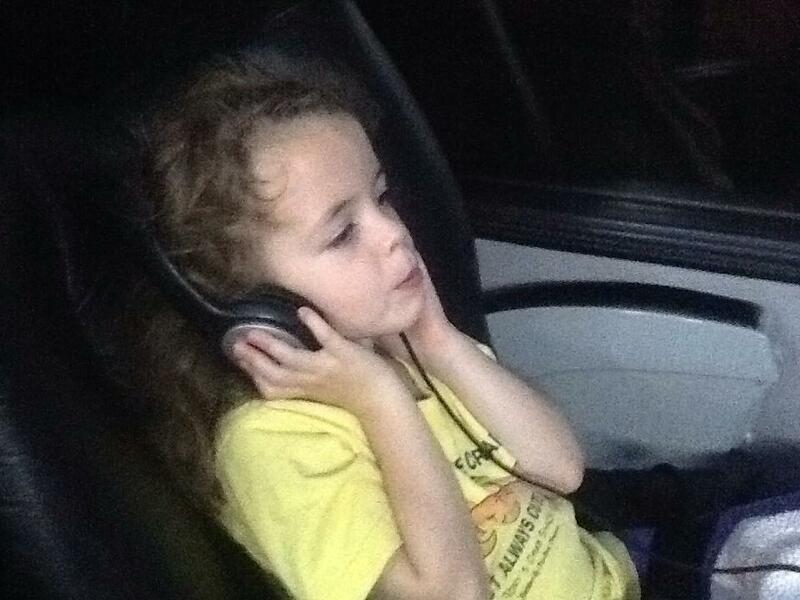 Molly enjoying her own video screen on Andesmar bus lines. I don’t think that I’m making a revolutionary statement when I say that over the years, air travel has become less and less enjoyable, although, maybe that’s because in those earlier times, I traveled by myself or with Rob, and now I travel with three children under the age of eleven. I write this and slap my forehead at the same time because we are about to embark on about six flights over two weeks that will take us through Brazil and back home to Portland. WHAT AM I THINKING?!?!? Have I ever had really, REALLY carbonated water delivered to my house once a week in adorable seltzer bottles? No! Do I LOVE it? YES!!!! Have I ever lived in a house with a pool? Have I ever relied on my YOUNG children to help me get my point across to another adult? Have I ever spent so much time together with my family? NO! This has been an exciting (and sometimes exhausting) year of learning. While in Salta, a city with incredible colonial architecture in northern Argentina, we visited the MA’AM museum. This was one of my favorite museum visits, by far in Argentina. The museum houses a small collection of artifacts collected from tombs found high in the Andes Mountains, and three incredibly preserved mummies. Only one of the mummies is on display at a time, for preservation purposes, and we were lucky enough to see the boy. These mummies are children who were part of an Incan ritual that helped to protect the people who lived in the areas surrounding the Andes. The children were brought to the mountain peaks alive, and dressed in beautiful, ornate ceremonial clothes. They were given a sort of corn alcohol to drink and cocoa leaves to chew, and then buried in stone tombs on the mountain. The museum was very quiet as people shuffled trough the small space looking at the artifacts and reading the descriptions. As we quietly walked into the room containing the small mummy (in a special plexiglass cylinder kept at near freezing temperatures and low humidity), Ben said to me, “Mom, do you think the kids KNEW what was going to happen to them when they were walking up the mountain?” I still get the feeling of someone punching me in the gut when I think of that question. I had no answer for Ben, and told him as much. I tried to talk about how it was a very different culture, and it was a very different time, but those words didn’t begin to address what he was wrestling with inside his seven-year-old brain. Have I ever been to so many rugby games? Heck, no! But really, is it all that much different from fall soccer on Saturdays? Not too much. The drinks of choice for both adults and kids are different: mate instead of coffee for adults, and Coke or Powerade instead of water for kids, but other than that it’s still a bunch of kids running around having fun while their parents stand by and snap pictures and visit with other parents. I will say this, though: the bonds of rugby are STRONG, and more often than not, the son plays for the same club that his father and uncles played for, and many rugby families have known each other for generations. Have I ever lived in such close proximity with so many large insect-type things? Heavens, NO! Cockroaches AND scorpions? ARE YOU KIDDING ME?!!?!? Let’s just say that this one will fall in the “LAST” category, too. And I have to say that even though I have a great deal of respect for cockroaches–I really do!–they were around with the dinosaurs, that doesn’t mean I won’t spray the heck out of one, or smash it with a shoe the minute I see it. Have I ever been so lax about the kids riding around in cars without seat belts, or cramming onto laps in cars? Of course not, but lots of paradigms had to shift to live here, and I can guarantee that once back state-side, we’ll be back on track. Much to the dismay of my children, I’m sure. Another one for the “LAST” category, I guess. Quite luxurious overnight bus: see above! Long-term living without a dishwasher: Please GOD make this a last! I can’t afford the glasses and dishes I break! Living in a house with an absolutely spectacular quincho: I sincerely hope this ISN’T a “LAST,” and Rob and I are determined to do everything we can to recreate this incredible structure back home. This is only part of it, but this quincho is my absolute favorite part of the house! Spending lazy Saturday or Sunday afternoons eating, drinking, and visiting with friends and family. I certainly hope this, too, ISN’T a “LAST,” but as Americans, we always seem to be in a hurry to move on to the “next thing.” It seems that often we are looking ahead without recognizing the preciousness and beauty of the moment. 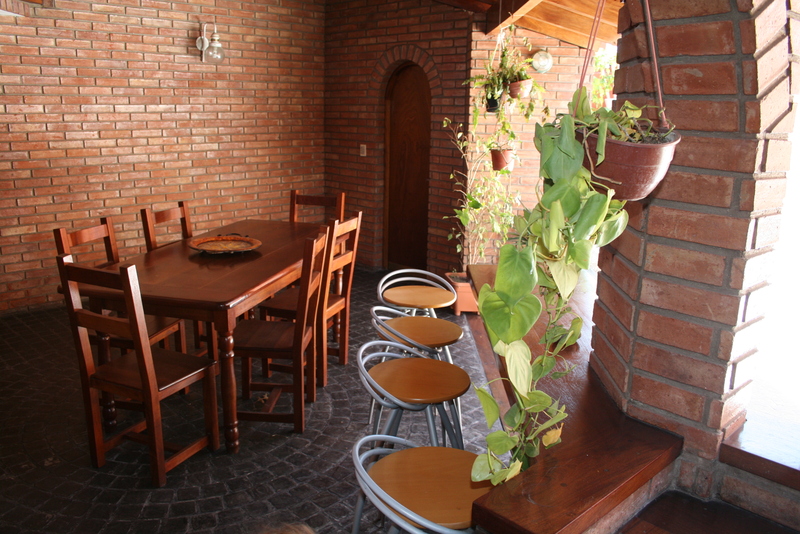 Tomorrow we have been invited to an afternoon asado with friends, and I find that recently, I am thinking, “Ohhhh! This could be the last time that we have asado with …………..” I know that when it truly IS our last Argentine asado (at least as pertains to this adventure), I will cry my heart out, and I’m sure I won’t be the only one. The kids have all come to love the practice of asado. What’s not to love? The kids run around and play, and come back for quick snack breaks, while the parents sit around without paying much attention to what the kids are up to! If you invite us over for dinner, and we’ve been there for four hours, and show no sign of leaving, just remind us gently that we’re not in Argentina anymore (sniff, sniff!). We’ll eventually leave, but we just don’t want to hurt your feelings by leaving too early! The besos (kisses) hello and goodbye have become second nature for us (even Rob! ), so don’t be weirded out if we come in for a kiss: it’s been a long time since we’ve seen you anyway, so give us a kiss! If we invite you over for dinner that very same night, or the next day, don’t think that we’re bored at the last minute: we just want to see you NOW! We don’t want to wait a week or two, so come on over, and don’t be in a hurry to leave: we like spending time with you! Shrines to accident victims or saints along the road in Argentina are a very common sight. 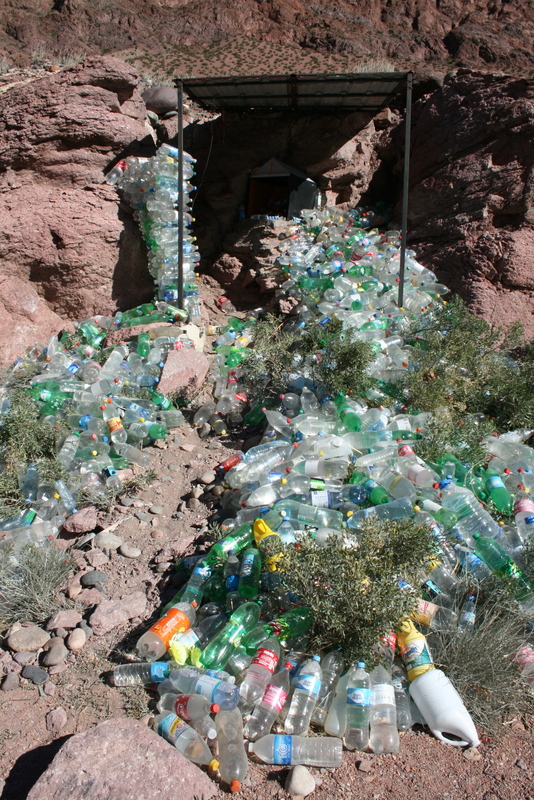 A visitor to the country might mistake devotion for excessive littering at times when passing by shrines to Difunta Correa. While driving from Mendoza to the foothills of the Andes near Uspallata, we passed the largest such shrine we’d see so far. It’s an interesting sight and story to share. Difunta Correa refers to the legend of a woman who attempted to find her husband during a time of war in Argentina in the 1800’s. While trailing the marching army through the desert with her baby, she died of dehydration. Her infant child was found alive, nursing at her breast by traveling gauchos. 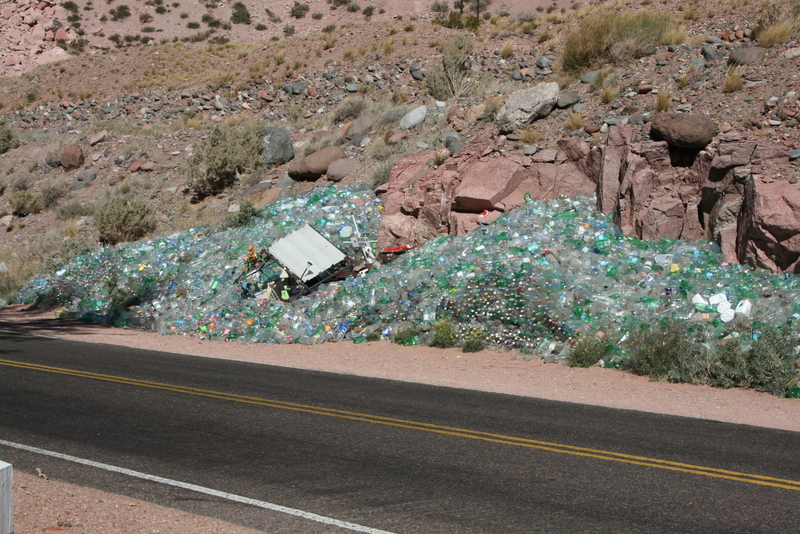 Hundreds if not thousands of roadside shrines throughout the country pay homage to Difunta Correa (Deceased Correa) and her thirst by housing piles of full water bottles and other offerings. Ruta 7 into the Andes from Mendoza is a beautiful, but desolate stretch of highway. While we probably noticed 10-12 shrines to Difunta Correa on our 2 hour drive, none was larger than this one. 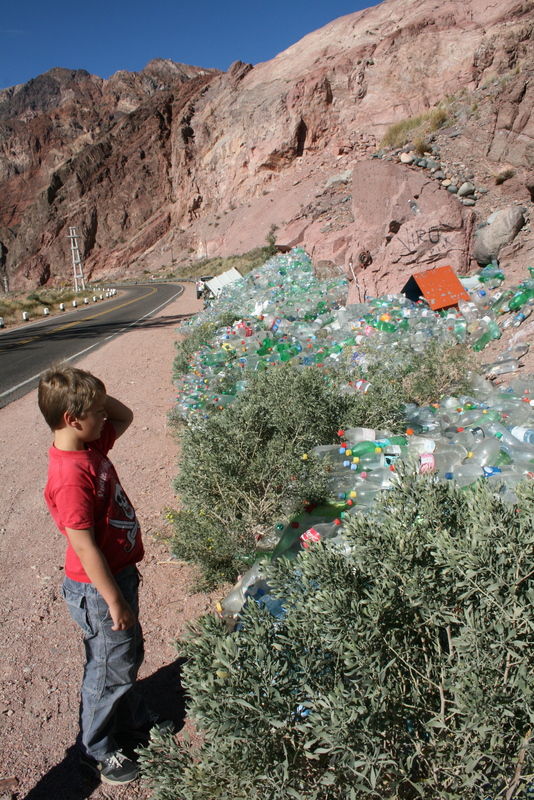 When we stopped for a closer look at this one, Ben and Molly were upset by the apparent waste of water. When Erica decided to contribute one of the bottles we’d recently bought, Ben nearly revolted. Traveling to Northern Argentina has always been high on our list of must-see destinations ever since we began planning to live here. Last week we finally ventured up to Salta and some of the surrounding areas while my Dad visited from Oregon. Some of our favorite parts of travel is the way it can educate, provide global perspective and disprove preconceived notions. 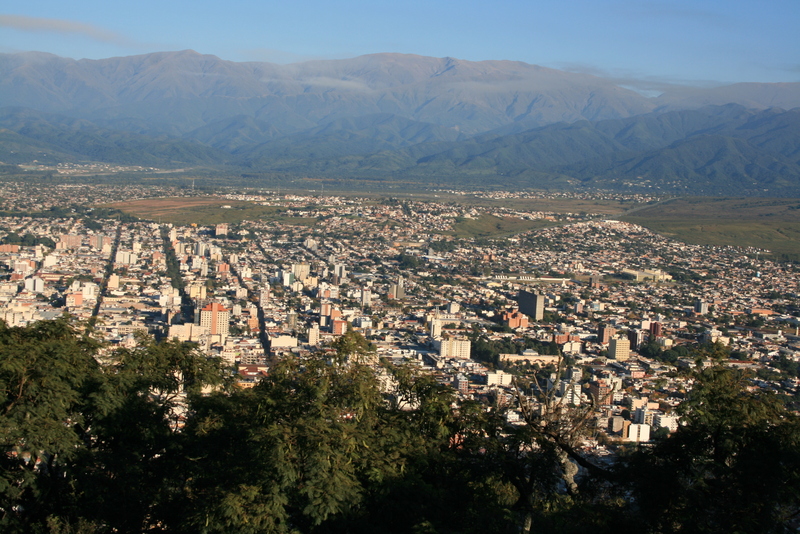 We had always imagined Salta as a desert land of red rocks and adobe, but instead we were surprised by the vast diversity in people, food and landscape. 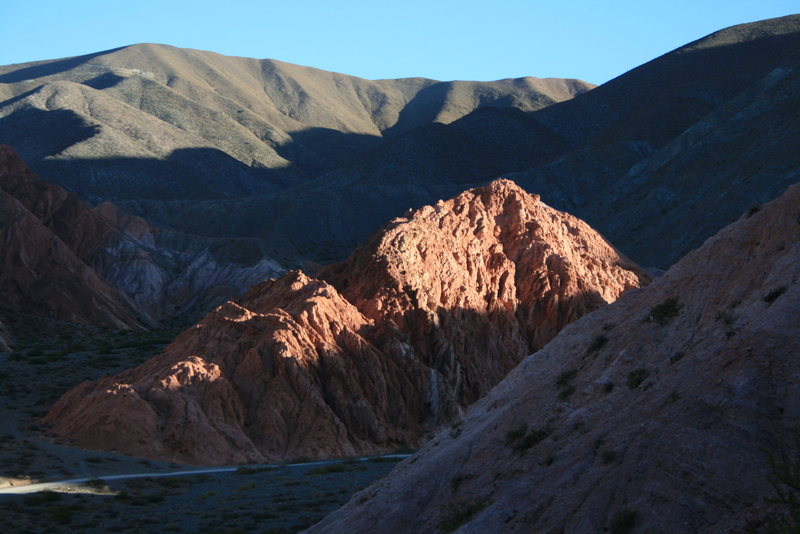 Land: Salta sits 860 km to the north of Cordoba and about 300 km south of the Bolivian border. To cap off my father’s visit to Argentina, we’d put together a 10 day tour to Salta and Mendoza before sending him home. 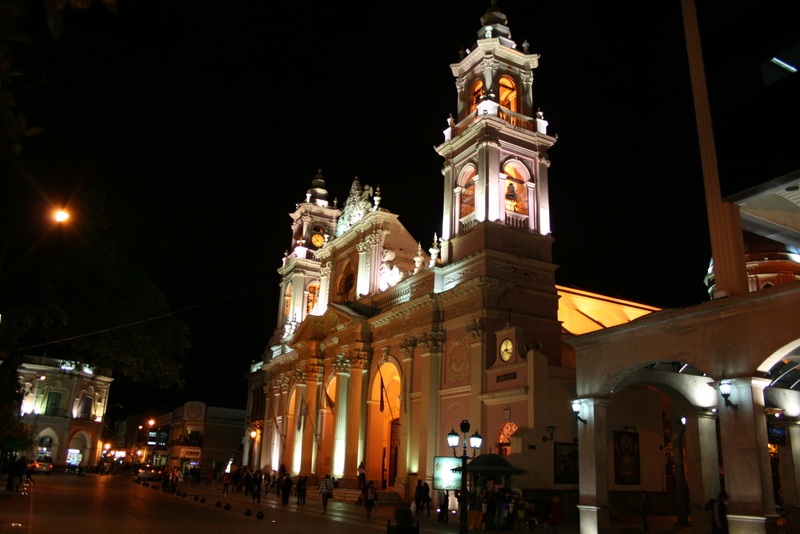 After the short flight from Cordoba, we spent 5 days exploring the city of Salta and neighboring areas such as San Lorenzo, Purmamarca, and San Salvador de Jujuy. We noticed right away how wrong our ideas about Salta would be as we landed. The surrounding area is lush and green, with high, arid mountains to the west. The hills around Salta are a dense jungle-like landscape. It is only as you head farther north that the more famous imagery of Northern Argentina appears. We elected to rent a car for a few days in order to take a few day trips from Salta after hearing about how much the region had to offer. I think my Dad was ready to continue solo onto Bolivia after the long day trip to Purmamarca with 3 kids in a 5 passenger car, but managed to see part of the famous Quebrada de Humahuaca. In 2 hours we drove from a chaotic city, through dense green hills, into a broad glacial valley, and into the desolate foothills of the Northern Andes. Food: In most of Argentina, spicy food is rare. Not so to the north! Living in a college town like Cordoba, we’ve had our fill of lomos, pizzas and migas that lack any sort of spice. I can’t say we’re tired of empanadas though. 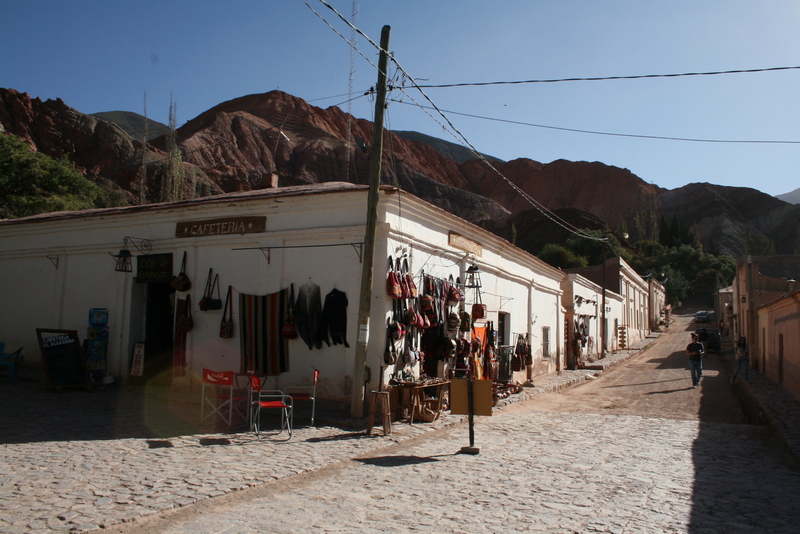 Standard fare in Salta and Jujuy includes tamales, humitas, llama empanadas and locro. Most restaurants also provide picante (sort of salsa and hot sauce mix) to accompany tamales or empanadas. The tamales are small and round, filled with corn meal and meat, but otherwise similar to what we’d find in Mexico. Humita is a sweet, corn-based sort of tamale that’s delicious. Both are wrapped in corn husks and steamed. We also managed to be in Salta on May 1st, when locro becomes a standard menu item in many restaurants as the weather turns colder. 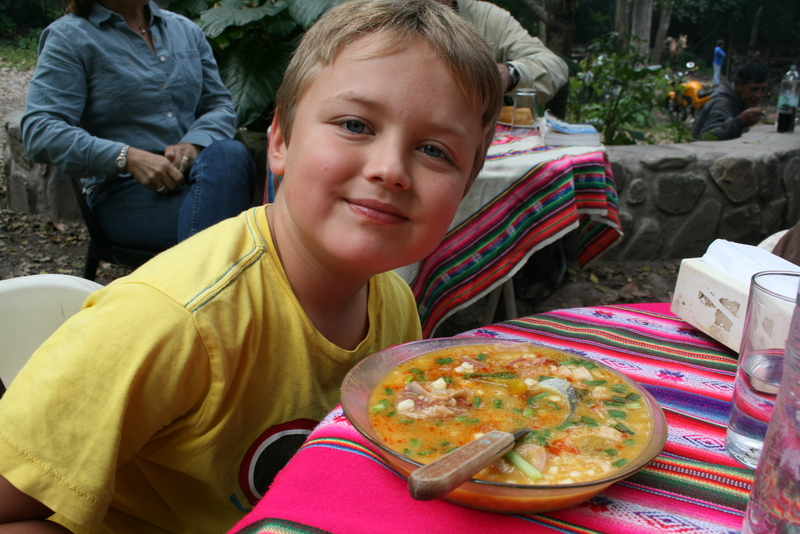 Locro is a stew of pork, corn and potatoes that varies widely based on the chef. We’re determined to track down a family recipe before we leave! People: It was fascinating to see just how distinctly different the people looked in the north. Features commonly associated with Peru or Bolivia like high cheek bones and dark complexion stand out in Salta and the north. The huge influx of European immigrants that diluted the indigenous population in so many parts of the country and makes Argentine people so incredibly diverse has not reached the north. There’s an incredible quantity of textiles and crafts available in the north as well. True gauchos are a common sight with their flat brimmed hats or berets, trousers tucked into high leather boots, and red sash at the waist. So many leather boots might explain the disproportionate number of shoe shiners in the main plazas in Salta. Sitting in an outdoor cafe on the edge of Plaza 9 de Julio ensured we would have a minimum of 5 shoe shiners stop by to see if we needed a shine, even if we didn’t have on leather shoes. We also noticed a strong police presence that is not visible in Cordoba. Pairs of police officers seem to be on every corner. Check points on the highway were more frequent. 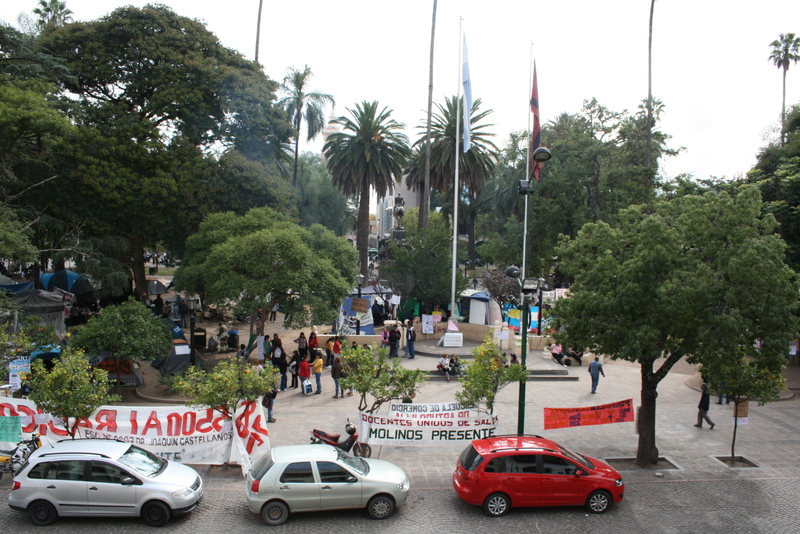 It was a bit unnerving to see so many, particularly ringing the teachers on strike in Plaza 9 de Julio at all hours. We could have easily spent a month or more in the north and still not seen it all. Even with one year we are finding that Argentina is too vast to see all of its many wonderful sights.